The last time I wrote about wildfire haze over Downtown Vancouver was back in 2010, but I’ve never seen anything like what we’re experiencing right now. It’s not just a haze or smog-like plume of smoke drifting out of Burrard Inlet and hanging over the city, this is a fully enveloping cloud, from sidewalks up to tower cranes, that has engulfed the region and made everything, inside and outside of houses, smell like campfire. Two resources to rely on at this time are the BC Air Quality and BC Wildfire websites. 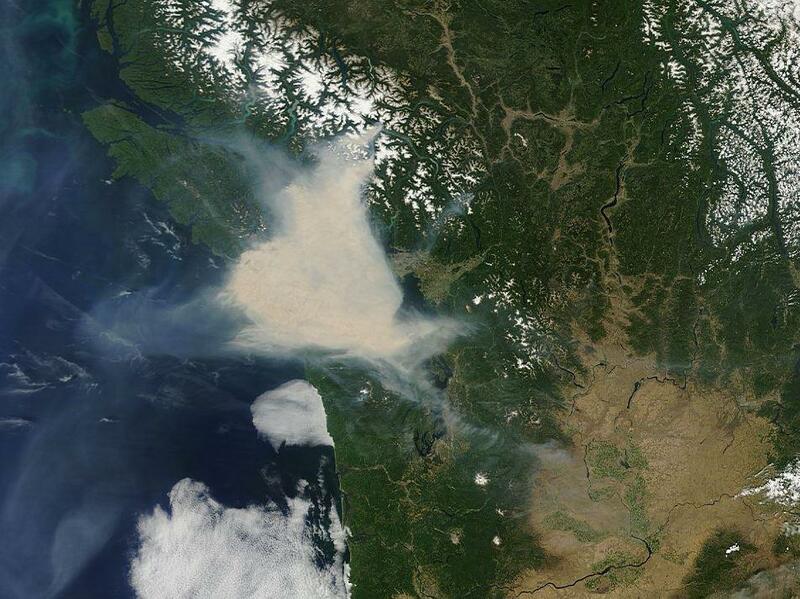 July 6, 2015 Sunshine Coast The Ministry of Environment in collaboration with the Vancouver Coastal Health Authority is continuing the Wildfire Smoke Advisory for the Sunshine Coast and surrounding areas because of forest fire smoke that is affecting areas from Powell River to Gibsons/Langdale and surrounding areas. Smoke concentrations will vary widely as winds, fire behaviour and temperatures change. This situation is expected to persist until meteorological conditions change. Avoid strenuous outdoor activities. If you are experiencing any of the following symptoms, contact your health care provider: difficulty in breathing, chest pain or discomfort, and sudden onset of cough or irritation of airways. Exposure is particularly a concern for infants, the elderly and those who have underlying medical conditions such as diabetes, and lung or heart disease. All open fires are currently banned in BC, this even extends to charcoal barbecues on beaches. Follow BCForestFireInfo on Facebook for the latest news. If you see a wildfire — not just smoke clouds in the city — call 1-800-663-5555 or *5555 on your mobile. For Wildfire information, call 1-888-3FOREST. Thoughts are with those in the affected communities and also with those battling massive the blazes across our province.